It's been a fantastic year so far at the box office, with one movie or another outperforming expectations almost every weekend. I'm curious to see if the trend continues with this summer's crop of mega-blockbusters. I mean, if Fast & Furious can rack up $70 million off-season, who knows what kind of numbers we might be looking at once the big guns start rolling out? And oh man, are the guns ever big (is Hugh Jackman part ox or what? Jeez.)! Let's get to the predicting! May is full of sci-fi heavy hitters, but I'm giving the edge to John Connor and his robot troubles. Despite the cyborgs and time travel stuff inherent in the story, I get the feeling that this will be more accessible to non-geeks than Star Trek or Wolverine. 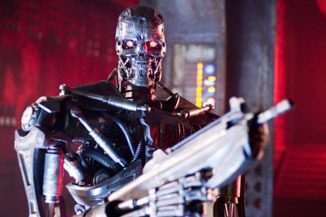 Six years ago, Terminator 3: Rise of the Machines opened to over $40 million in spite of lackluster trailers and the presence of Claire Danes. I think the bar has been raised quite a bit since then, mostly due to Christian Bale taking on the role of Connor just a year after driving the The Dark Knight to record sales. Bale being in the movie almost subliminally makes it seem like a fresh reboot, rather than the straight-up sequel it apparently is. It also helps that the trailers are fantastic. The wild card here is director McG, with only the Charlie's Angels movies and We Are Marshall on his feature film resume. I'm a little nervous that the man behind Charlie's Angels: Full Throttle has been allowed to even be in the same room with cameras, much less given the go-ahead to helm a tentpole sci-fi summer spectacle. I guess we'll know how it works out soon enough.